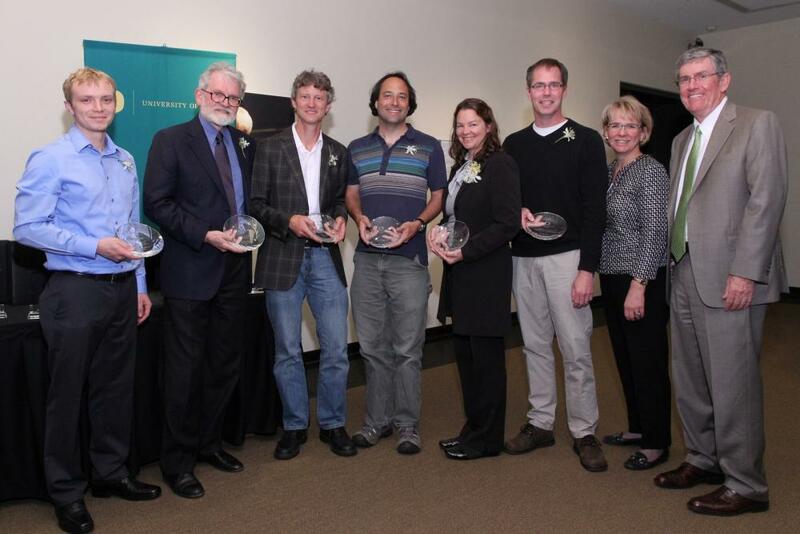 Nominations or self-nominations for this year's UO Research Excellence Awards must be received no later than Wednesday, April 9, to be considered for the six awards that will be presented in four categories. The awards and a presentation event later this spring – sponsored by the Office for Research, Innovation and Graduate Education – are intended to raise the visibility of research activities at the UO. Award recipients receive a commendation from Kimberly Andrews Espy, the vice president for research and innovation; $1,000 (or $2,500 for a team) in research support; and a recognition memento. The work of all award winners will be highlighted on campus, and those who receive this year's two Outstanding Career Awards will be tapped to give UO Presidential Research Lectures in the coming year. The Outstanding Career Awards will be given to two tenured faculty members at the rank of associate or full professor, and a single Early Career Award will be given to a tenure-track faculty member at the assistant professor rank. Two Outstanding Accomplishment Awards will be given – one to a career non-tenure-track faculty member engaged in independent research activities, and the other to a career non-tenure-track faculty member engaged in technical activities in support of research, such as core facilities or statistical analysis. The Innovation and Impact Award will be presented to an individual or team for outstanding entrepreneurial activity. Nomination letters for each award must be no longer than two pages and must detail the nominee's research impact and significance. Members of the Research Advisory Board – a panel of UO researchers from across campus – will review the nominations and make recommendations for this year's awards to the vice president, who will make the final selections. Nominations should be addressed to Kimberly Andrews Espy, Office for Research, Innovation and Graduate Education,1266 University of Oregon, 203 Johnson Hall, Eugene, OR 97403-1266. Electronic submissions should be sent to ncrow@uoregon.edu with the subject line: UO Research Excellence Awards Nomination.